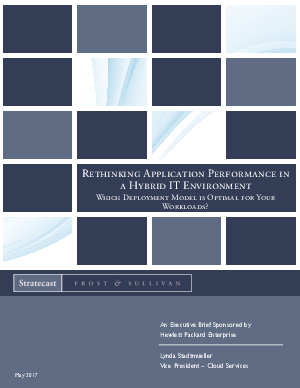 In this Frost & Sullivan report, they look at how the hybrid environment calls for a new way of thinking about “application performance.” They show how application performance is impacted by choice of deployment model (on premises and in the public cloud). They look at workloads whose performance requirements make them candidates for on-premises deployment, and identify the link between “optimal performance” and achievement of business goals. Finally, they offer suggestions for getting started with your workload assessment process.